The Brown-nosed Coati is a member of the Raccoon family and has a long snout which is white near the end and around the eyes. The coati has small ears, dark feet, brown coat and a long, thin tail. Habitat: They inhabit wooded areas of the Americas. Population: The Brown-nosed Coati is currently not endangered. Lifespan: In the wild, coatis live for about 7 to 8 years, while in captivity they can live for up to 15 years. Diet: Coatis are omnivores and their diet consists mainly of invertebrates and fruit. They also eat small vertebrate prey, such as lizards, rodents, small birds, and birds’ eggs. 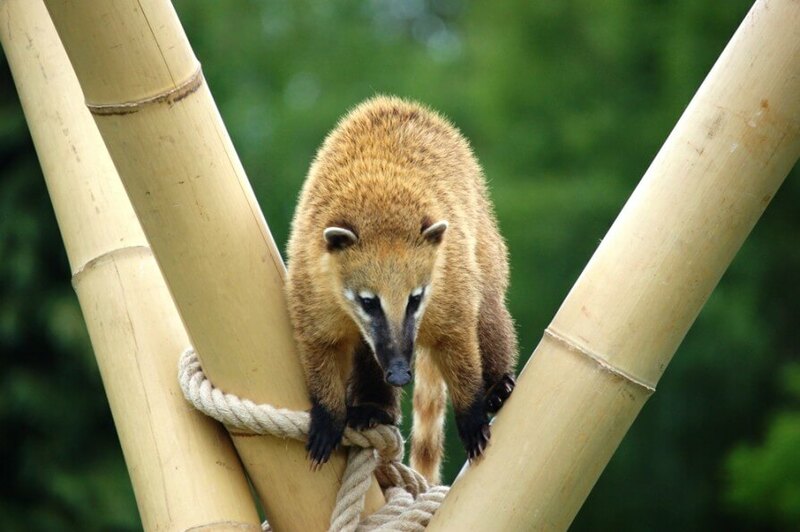 Behaviour: Coatis are mainly active during the day and sleep at night. They use many vocal signals to communicate with one another, and also spend time grooming themselves and each other.